Your browser does not support the audio element. Please try again with a modern browser such as Chrome or Firefox. Listen to this a few times. Can you understand what is being said in the sentence? Now listen to the sinwave sample again. Can you understand it? The text is from TIMIT, 'she had your dark suit in greasy washwater all year'. Most people can't understand the sinewave speech (SWS) the first time they hear it, but after listening to the corresponding speech and going back to listen again, they can usually understand the SWS version almost perfectly. The interpretation is that the brain did not recognise the SWS recording as being speech, and it was thus 'sent' to a non-speech part of the brain for processing. By listening to corresponding speech, you are training the hearing part of your brain to recognise this kind of recording as a type of speech, and to send it to the speech processing centres of the brain. If you do this enough, eventually your brain will always interpret this as speech-like and you could actually become very competant at understanding sinewave speech. The interpretation is that the sinewaves we are listening to are actually the direct formant frequencies - which is one reason we know that formants are very important to speech intelligibility! To form sinewave speech we thus just need to extract formant tracks and then synthesise sinewaves at those frequencies. Interestingly, readers from much of the Western world and Commonwealth may have grown up being exposed to a kind of non-technical sinewave speech (from swanee whistles) if they watched the BBC Clangers as a child (you can view the original first episode from November 1969 here). Sussex University SWS demonstrations, generated using the audio toolbox called Praat. In my opinion, by far the best practical resources available for SWS experimentation are from Dan Ellis of Columbia University. His MATLAB code for SWS creation and analysis is excellent, and his explanations can't be bettered. A set of different SWS demos from Tim Prebble, NZ. Further explanation from Al Bregman, McGill University (actually an excellent website all round for various auditory phenomena). Another good resource is from Matt Davis of the University of Cambridge Cognition and Brain Sciences Unit. Now we will make direct use of some of Dan Ellis's code to extract formant tracks, and later we will synthesise sinewaves at those frequencies. First of all let's include some helper functions that Dan has written (these are unchanged from the code downloadable from his webpage). %    and the residual excitation in e.
%    for independent near-perfect reconstruction with lpcsynth. %    this into poles, and return the frequencies in rows of f.
%       D is a speech example sampled at R samples per second. %       defined by a row of F (frequencies in Hz) and M (linear magnitude). %       Each column of F and M corresponds to H samples at R.
In general there should be some correspondance in time between the features visible in the speech waveform and spectrogram, and in the formant frequency (F) and magnitude (M) arrays. Now we are going to reconstruct sound from those arrays. The most efficient way to accomplish this is to use the synthtrax.m code on Dan Ellis's website. However for the sake of keeping things simple and very clear, we will make use of freqgen.m to construct sinewaves that vary in frequency to match the formant patterns. Please refer to the freqgen() code in the book (and the explanation of how it works). The freqgen.m function can be downloaded from here. Now that we have three formant frequency sounds, we can listen to these separately to reacquaint ourselves with the Clangers speech, before reconstructing a final output. Given the fact that the reconstruction processing is very slow, the reader is encouraged to try this code with some short samples of a few seconds length only. 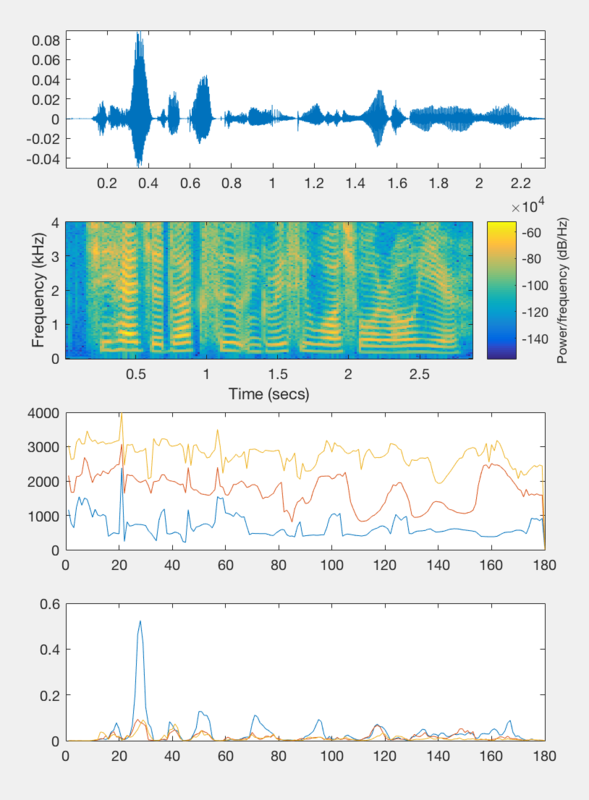 Try plotting the reconstructed spectrograms and comparing them to the original speech spectrograms (and waveforms). We will leave this topic with one final example. This one is a very famous quote from world history. Can you recognise what is being said? Can't understand it? Try again... (and try the example above again). If you really can't follow this, try listening to the original recording below, then retry the SWS example.